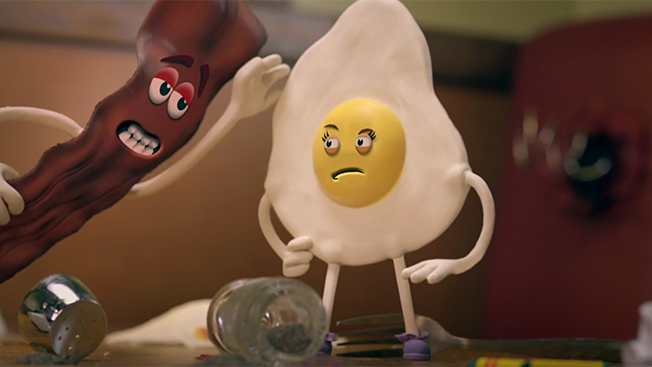 For the past year and a half, Denny's "The Grand Slams" online video series, which feature wisecracking animated breakfast foods partying at Denny's restaurants, have resonated with the brand's millennial audience—to the tune of 37 million total views. This year, Denny's also experienced its highest same-store sales and traffic growth in over a decade, and its marketing team credits the quirky web series, in part, and an equally quirky Tumblr page for the spike. "The engagement, specifically with the millennial audience, has been phenomenal," said Denny's CMO John Dillon. "Our content leans in to the sense of humor of our brand, which is slightly off-center." Denny's latest "The Grand Slams" video, which launches today, is part of its partnership with the movie Independence Day: Resurgence. In it, the cartoon breakfast foods brace themselves for an alien invasion—tin foil hats, burning trash can fires and all—before realizing the "invasion" was actually a trailer for the movie. As part of the promotion, Denny's also is sponsoring a social media sweepstakes, asking its followers who they'd choose to help defend against an invasion and post a picture of the group of people they'd fight alongside. By hashtagging the photos on Twitter or Instagram with #IDRSweepstakes, people will be entered for a chance to win a trip to the movie's Hollywood premiere. Denny's will continue to produce "The Grand Slams" series as long as millennials keep eating it up, Dillon said. "Everybody's trying to be relevant to millennials, but our goal is to keep our brand top of mind and entertain them so when they're hungry, they think of Denny's," he said. "And that drives traffic to our restaurants."